After what seemed like never ending months available, the week finally dawned and GABRAN 2017 was here. The week when suddenly everything that was “waiting for something to happen” comes together like the well oiled machine it has become. From humble beginnings in 2014…flip the calendars to 2017 and GABRAN 2017 is already done and dusted! And once again, before we left to the comforts of our warm homes, the question was asked…. dates for 2018 please. We picked up all the numerous goodie bag items from the greater Kwazulu-Natal area – some being transported in from Gauteng and kindly delivered by courier. Receiving boxes at work was like receiving an early Christmas present and we were eager to open up and see what was inside… and maybe some taste testing – just to be safe as we had been sponsored many “not on the market” yet products. So we were privileged at these tasty samples that were sent to us. We opted for a back pack this year, just to be different, and this was all finalised and done within a week – including a public holiday in between. We always leave these to “last minute dot com” once we have closed and finalised entries to prevent any unnecessary costs. Our shirts saw another long sleeve number – and how appropriate for the cold that awaited us! These were also done in record time by a supplier. We spent the Tuesday evening, sorting and putting all the goodies on the table ready for the annual GABRAN pack-a-thon. 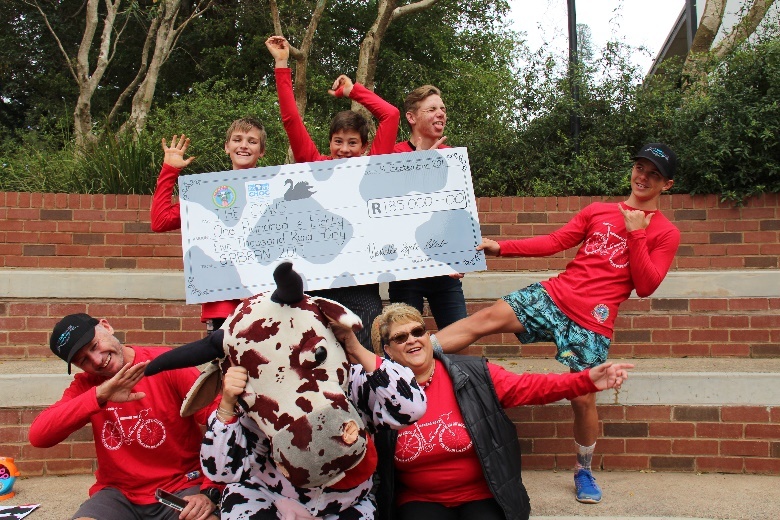 Again, we all modelled the products so that we could give our sponsors some mileage on our Facebook page and also send them a few pics of the crazy cows as a token of our appreciation. We knew we hit another great goodie bag, when we had to actually have a small logistics meeting after the 10th bag packed, to work out how to fit everything in the bag… it was really not rocket science, but our enthusiasm got the better of us and we started the process of packing with little thought initially. Once the bags were packed, zipped and ready to go, we flattened all the boxes, so that the Du Sarts garage could return to a normal garage. We lined the red goodie bags up in neat rows, and our first task was complete. Final checks on raffle items, wrist bands (Klip or Klap), envelopes and payments were done by the ride organisers, ready for GABRAN 2017! The sponsored truck arrived on Thursday morning to pack “everything that needed to be packed” from the event point of view – marquees, goodie bags, tables, and a few sneaky tents/bicycles and other camping paraphernalia. The truck was off – and the “ride directors” were off in close pursuit! As we drove past Nottingham Road…eish… we then noticed it… this spectacular site… of WHITE… no, not the lines on the road…no…not the clouds in the sky…. but the WHITE of the mountains… and we not talking SNOW CAPPED mountains either…we talking WHITE MOUNTAINS – from the top of the top to the bottom of the bottom of the mountains… we sniggered and laughed as we knew it was going to be rather chilly on Friday morning. A necessary stop in Bergville was required, as we needed to sample more PADKOS and we had brought a rather short supply of ZORRRRRRRRRRRRRRBA! 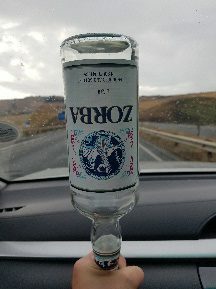 Gosh, we went into all 2 possible “non-soft drink” stores, and were met with blank faces…no-one knew what ZORRRRRRRRRRRRRRBA was… we don’t give up that easily… We had to call in the forces… from LADYSMITH… and have some imported on Friday morning….and delivered!! But – then we would have a rather short report! Once again, Thursday evening saw everyone get into the spirit (or spirits) of things, and we met some of the other local residents at ATKV… (Other Secunda inhabitants) and being the fun bunch we are – we invited them in to join our little party… and of course sell them some raffle tickets! Dinner was buffet style in the dining room – after which, we proceeded back to our house for the night… but first, stopping off at our new found friends for some beverages, and some sokkie sokkie and just general clean fun and laughter. GABRAN is not the same without a rendition of KAPTE IN and LOSLAPPIE every night (and that is with actions!!) At last we had to leave, as certain members of the cycling family had to prepare bikes, and bottles and all sorts for the Groot Trek the next day. We were barely down the road, when we heard the screams “LOST AND FOUND, LOST AND FOUND” and along came our friends (um, they did have names) carrying a certain ladies handbag. What kind people they were returning our property. We shut the door for the evening, and serious preparations on bikes and bottles began… as well as setting alarm clocks for an unearthly hour to prepare for registration…knock knock… on the door…and once again LOST AND FOUND LOST AND FOUND…. it was our friends…with another “belonging” that was left behind – I really cannot recall what it was, but it was important. We offered them a glug of ZORBA for their efforts. (Thats ZORRRRRRRRRRBA!) It is then that we discovered this horrific thing – there was no coffee! No problem – we sent the one and only Skoenda on a mission back up to the dining hall to see if he could “sneak” some coffee for us. He returned – laden with sachets of coffee, cremora and sugar! 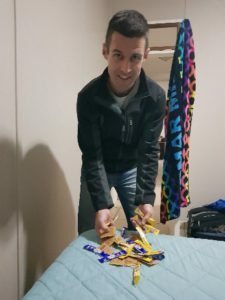 After some serious whatsapp conversations signing people up for double loops of 947 race (OBS, ZORBA, BEER always a contributing factor) as an apocalypse cow, our night was a success… and a relatively sleepful night was had by all in our little house. Registration was cold, cold and more cold! We reorganised the local restaurant to suit our needs, making a single ent rance and exit point. Many hands certainly made it a quick process of setting up and getting things going. After some very welcome hot freshly perculated coffee and rusks and just before we “officially” opened registration, first things first, we all bought the uber awesome beanie! Eskimos arrived to collect their goodie bags, (once again, underestimating the weight of the bags – and again awestruck by the generosity of the sponsors) meal wrist bands (klip or klap) and event shirts. 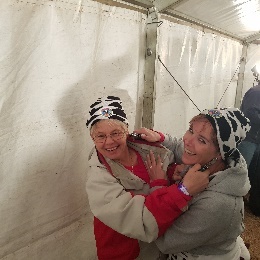 They came armed with some cash, as we were selling, straight off the production line, beanies… yes, COW PRINT beanies. What an absolute hit this was – young, old, and everyone in between bought! A very clever idea indeed (well done Daisy in JHB – full credit to you for fresh novel warm merchandise). Strange how you never know who the “newbies” are, but as soon as they arrive for registration, you immediately form a bond – be it that bond of… what the heck are we in for… We had many virgin GABRANERS this year, from a far afield as Pretoria! 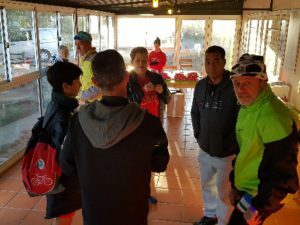 Team Registration then departed to pack the silver bullet – ok, pack is not the right word here – shove and “mik en druk” everything all over the silver bullet – just being sure that there was enough safe space for the driver. The rest – looked like – lets rather not say! 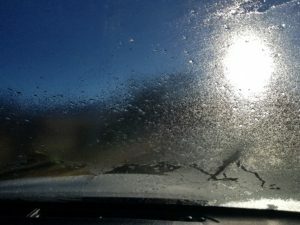 You know it has been bitterly cold when you n eed help to reverse the car up the driveway – because you cannot see a thing through the ice out the back, or the ice on the side mirrors or the ice out the windscreen… and then park the vehicle facing the big yellow ball in the sky so that the windscreen can thaw for 5 minutes! Cyclists set off in their own little batches – as and when they felt like going. 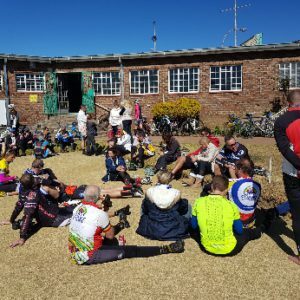 No podiums, no time pressure, no race… the only thing on their mind was the first official stop… Winterton Country Club. 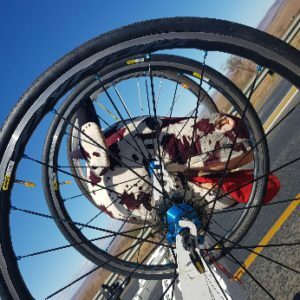 There were a few, ok, three cyclists, that decided a must do this year, was to go to “the states” so at the T-junction, they went right and yondered into the land of VRYSTAAT! There were the roadies, the mtbikers and of course the tandem! As the rest of the cyclists went about their business – it was against the beautiful white snow covered mountains. It certainly was a beautiful sight – and we can now officially say, that GABRAN happens, no matter what the weather conditions! The tandem wheel suckers did not disappoint again this year! Names available on request!!! 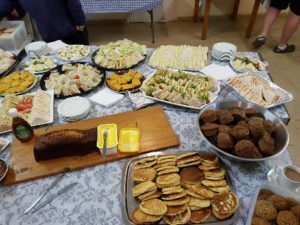 Once again, the Winterton Country Club were on top form with their flippen good spread – crumpets, muffins, sandwiches and more – and of course… the now famous cheese an d chutney sandwiches! Was a winner 2 years ago, and still a winner this year! Coffees and teas were most welcome to help thaw out the bodies after the first 50 or so kilometres. (unless you went to the States – they took a bit longer to arrive!) 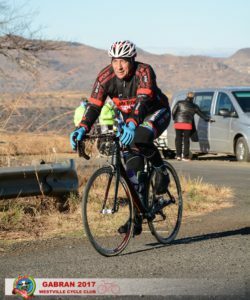 After the Winterton stop, cyclists knew what lay ahead – well, knew half of what lay ahead – and that was THOSE hills into Estcourt (the one where you turn your first right after crossing the N2).. unless your name is Chris Wright – and you go wrong – and go and see what the little town of Colenso offers…. 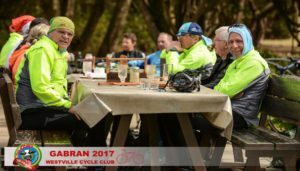 Cyclists also possibly regretted the added weight now in their tummies after eating all the yummy breakfast goodies at the club. “I love the wind” said no cyclist ever. The next stop was the Estcourt Bowling Club. This is the next highlight on the ride. Drinks flowed freely – or as one cyclists commented – quicker than a home sick mole. Festivities, laughter, chatter and getting thawed in the sun was enjoyed by all as we spread ourselves over the brown bowling green. It is the end of Winter just about. Always a pleasant sight to take over the bowling club for a few hours – and we are always welcomed with open arms! The last onslaught of the day was the short climb to Wagendrift dam, and then hitting the concrete road into the actual resort. 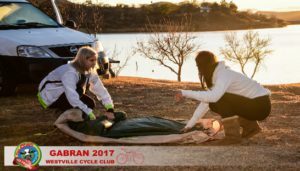 By now, guys and girls were over fixing punctures and broken chains (but the camaraderie of the cyclists helping each other, some “boer maak ‘n plan moments” is truly awesome to see – even if they were not in your “original” cycling peloton) and gladly hopped into the vehicles. Playing Tetris with bikes on racks is always a fun game – especially when you mix mountain bikes and road bikes on the same rack – added to small, medium and large size frames! Skills are required!! And then to get those owners bodies into a car… yes you guessed it – open the door and push everything over, and then get the driver to close the door… all aboard – lets go! A HOT DELICIOUS meal awaited all cyclists in the make shift kitchen/tent. Various cows took to the “Klip or Klap” task of clipping the meal bands before food, glorious food was consumed by all. It was then that TENT TOWN needed to pop up. Whilst the numbers for camping have dwindled slightly… with many preferring the “luxury” of the communal dorm, (as a newbie, check under your mattress for empty bottles!!) or the “elites” opting for self catering, tent town happened. Whilst we all gathered around to decide if we are indeed pitching our own tents, or rather huddling for warmth – huddling for warmth was the option. We tested out the “3/4 man tent” to the max – granted, it was a VERY tight squeeze, and only bedding and bodies had the luxury of being covered by a canvas – luggage was stowed under the fly sheet on the grass! 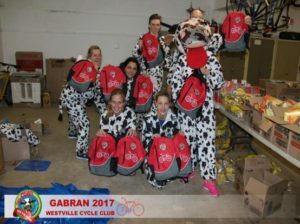 It was by far the coldest GABRAN we have experienced in our four years of being involved with GABRAN as THE COWS. Leggings, socks, GABRAN shirt, super thick cow hoodie, wrapped in blanket, inside sleeping bag. Result frozen at midnight. Get out sleeping bag and put on Cow suit. Get back in sleeping back. 2am Frozen. Find spare cow suits and fabricate a bedspread…. 3am, 4am and thank goodness 5am … still frozen to the core but at least we could get up and search for coffee… many walked out their tents putting the Michelin and Oros man to great shame – that is how many layers we applied. We certainly all wished for many hot flushes upon hot flushes! Day 2: Now known as: Griffon…Riffon…Iffon…FF…. Day 2 commenced with most tents covered in frost and bike computers reading a chilly zero degrees (we don’t think they could go below zero as it certainly felt that way!) but we were all relieved that the wind from the day before had gone. After eating a cooked breakfast, bacon, eggs, sausages, oats porridge, yoghurt, fruit, rolls (no, no toast! ), yes eating again, we packed the frosty tents and set off for the dreaded and feared hills… Concrete Road, Bacon Hill and Griffins (yes, they that important they have to have capital letters). Strangely a very cruel reminder that cake and biscuits and the good life are no good for hills… zero power, zero lungs and the “crawl, granny gear, curse and pedal” was very evident. There were of course, the youngsters of school going age that had way too much energy and decided that a double Griffin had to be the order of the day! After t hankfully making it to the top, (huff and puff and pedal your heart out) a very short sharp regroup in the cold, it was then the welcomed fast and freezing ride down (yes finally down!) to Mooi River Wimpy where we stopped and…… ate again! The Second Breakfast! Much warmer and full of second breakfast we climbed back on the bikes to make our way firstly UP Rosetta Mountain and then down to Bierfassel. We tend to forget the hill out of Mooi River when ordering the second breakfast but to be warm is always worth it. Bierfassel did not disappoint although more fires would have been welcomed as we sat like frozen berries trying to keep each other warm during this break and decided that we should rather head back to Midmar because………………………. Tadaaaaaaaaaaaaaaaaaaaaaaaaaaaa some had decided that one night of canvas was more than enough and the most incredible castle awaited… The Chalet. Best money ever spent in my life. Warm shower, beautiful bed, heater, the list goes on and on. Tent town was erected yet again, with most opting for the slightly secluded spot behind the ablutions – and tents pitched as close together as possible…. Delicious lunch was served (again) and then the afternoon was spent just “chilling” or going to the local pub to support the Springboks. Whilst this was happening, it was “raffle admin time”. Time to sort out raffle sheets, number them, and make sure everything was ready for the biggest draw ever. Over 100 000 rands worth of prizes. This would NEVER be possible without so many generous companies and individuals believing in our cause and event. The raffle was, as always a big hit, and went off well. The lucky winner of the most tickets sold was Iris, with over 1500 tickets that she sold both locally and internationally. She won her tandem back! Who says you cannot win your own prize back that she had kindly donated to the cause at the start of our “raffle gathering”! That is dedication to the cause for sure! Dinner was another warm and wonderful gastronomical delight – and once again proves that you are super well fed during GABRAN! Another evening of getting out the dancing takkies, vodkas, Zorbas, wines and beers to name a few followed. Our own dance queen, Paula, got the youngsters up and razzling – age has no limit! Luckily, this year, the rain stayed away kindly! Some campers had to swop mattresses and build stretchers in the middle of the night, as mattresses slowly but surely deflated – but that is what this event is all about, fun, team work, and building memories! Just when we thought it couldn’t have been even colder, we awoke to frost now on the inside of the tents on Sunday morning. Nothing a cup of coffee or two and cooked breakfast didn’t cure. After packing up, okay, more like shoving it into the tiny bag they provide you with, and wet, it was back on the bikes for the last day of GABRAN. The cyclists departed earlier than the previous day, as day 3 is a rather long ride. The vehicles then decided it was time to leave… well, so we thought! A certain lady decided she wanted to take a piece of Midmar with her, and managed to go over a yellow boulder… and then got stuck! There was only one option – phone the husband! Said husband returned at a rapid rate of knots, took one look, hopped into the said vehicle and merely said “WATCH”… which we did… one two three – and the vehicle was free!! We were blessed with not as much wind as we had on Friday and the pedal up past the Rotunda sorts out all the chills. It of course doesn’t help the aching legs. The fast downhill on the old town hill is always a hit for the brave… the rest, we use the brakes to full capacity! Going through PMB the debate was going through Polly Shorts or up Fox Hill with most riders choosing Polly Shorts as it is not often that one gets to “enjoy” Polly Shorts. 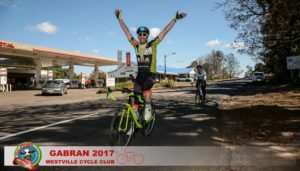 Most of us were on familiar territory and after a quick stop in Camperdown it was the thought of just 30 km till the finish that kept most of us going. Hillcrest is always a welcome sight – and more so the Hillcrest Villagers Club. 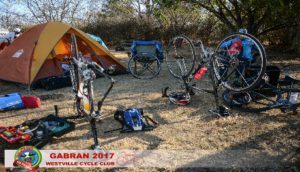 Once again, we dominated the venue – with bikes, tents bags, kit bags and the kitchen sink. Lamb on the spit is always an absolute winner. Seeing the cyclists reminiscing about the 3 day event, hearing all the laughter and nattering makes it an event to remember. 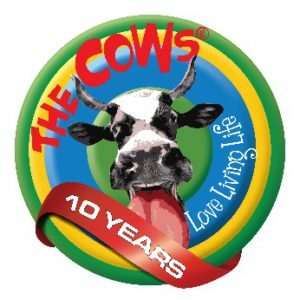 The aim of GABRAN is to raise funds for THE COWS who are the fundraising arm of CHOC (Childhood Haematology Oncology Clinics). 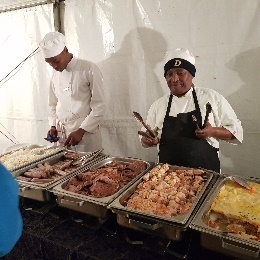 The entry fee for GABRAN is used purely for covering costs of the event – the meals are catered for by a professional catering company from Durban, (and you see just how well we eat!!) the campsite costs, hiring of marquees for the make shift kitchen and communal eating and dance area, the paramedics, safety files, road permissions, entertainment in the evenings – without any of these, the event simply cannot take place! No admin fees whatsoever are deducted from the monies raised – we are all volunteers, doing what we can, for those, that can only hope and dream of having an active lifestyle, beyond the 4 walls of a hospital room, drips, needles and other medical devices. That is a whopping total of R 570 000 in 4 years! BE PROUD GABRANERS & ALL OUR GABRAN FRIENDS BE PROUD!!! An event like this is not possible, without the phone calls, meetings, dedication, laughs, seriousness and chirps from Kelvin and Corinne. There are so many behind the scene items that need to be sorted – from the entries and admin associated with them to the meals, to the campsites, truck logistics, road permissions, safety files, medical assistance to name but a few and all this they do from the bottom of their hearts for the cause and for the sport that they love and are so passionate about! Thank you just does not seem to be sufficient – year after year! 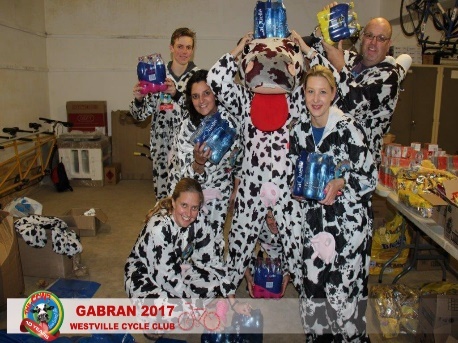 GABRAN – IT’S NOT A RACE… IT’S AN EXPERIENCE! !